Many middle school curricula include attention to ancient American people and their cultures. This blog entry may be helpful in making connections to the nature of science and scientific enterprises as part of an integrated approach in studying the Anasazi or ancient Pueblos. The story titled “Vanished: A Pueblo Mystery,” published in the New York Times, April 8, 2008, enlightens readers regarding the science of archaeology. Archaeologists rely on empirical evidence to reconstruct past events. However, this empirical evidence does not normally emanate from controlled laboratory experiments, conceived of and performed at the scientists’ will. Rather, archaeologists use evidence left by the activities of not only people that lived long ago but other organisms as well. They must be skilled observers. This is not the first time this question has been asked or that an answer has been proposed based on evidence. For example, drought has been documented during this time, providing a seemingly good explanation for the migration. However, evidence suggests many people were able to survive the drought. That fact casts doubt on drought as the only cause for the migration. Further, the area the Anasazi migrated to was actually drier than that which they migrated from. An alternate hypothesis is based on the pollen record. “Measurements of the thickness of pollen layers, accumulating over decades on the bottom of lakes and bogs, suggest that growing seasons were becoming shorter.” Even this fact in combination with the relatively short drought does not convince many archaeologists these were the reasons for the migration. Why did the Anasazi never return, even when the drought ended? Evidence suggests they did not leave in a hurry, but planned their exit as if they intended to return. Even more interesting hypotheses are presented regarding the role of religion in the migration. Donna Glowacki, an archaeologist at the University of Notre Dame, cites evidence that suggests the early culture of the group, prior to the migration, included a tradition where only a select, privileged few had access to the largest, most well-equipped dwellings. She asserts a change can be detected after the migration in the southern villages. There evidence indicates fewer of these select kivas are found, suggesting there was less reverence for a select few. The article indicates this change could be analogous to the Protestant reformation. So who’s right? Well, no one knows for sure, but the Village Ecodynamics Project is set to bring together these various hypotheses to see if a coherent, though probably somewhat complex explanation, or theory, can be constructed. The researchers will use evidence of “rainfall, temperature, soil productivity, human metabolic needs and diet, gleaned from an analysis of trash heaps and human waste” to reconstruct events and come to conclusions. The article illustrates well the nature of science. 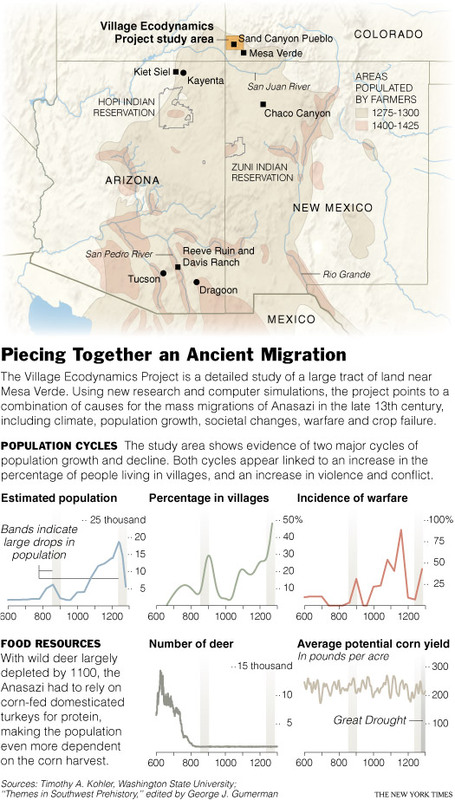 Our understanding of the Anasazi migration is undergoing revision in light of new evidence and reinterpretation of existing evidence from new perspectives. It calls attention to the various scientists working on the same project, each contributing unique expertise and building new knowledge. The article conveys several possible hypotheses, all of which need to be thoroughly investigated to see if any can be discarded. It underscores that scientists don’t have definitive, pat answers, only best guesses based on reasonable interpretations of much evidence. Several kinds of, or sources of, evidence are identified giving readers an indication of the nature of archaeology in particular. Ask students to describe archaeology. Affirm their responses and ask them to elaborate as much as they can. They should use terms like ancient, culture, science, observation, inference and reconstruct. Ask students what kind of knowledge or skills a good archaeologist needs. They should include knowledge of anatomy, plants, and history, and excellent observational skills. Archaeologists need to be global thinkers, able to see relationships among seemingly disparate observations. They should be good team players. If needed, ask leading questions such as: What other fields of science might be related to archaeology? They should include botany, zoology, and anthropology even if they don’t use those names for them. Explicit connections to life science and earth science can be made, particularly to botany and climate. Ask students how knowledge of the growing season can be inferred from the pollen record. How can inferences regarding wet or dry years be obtained from tree rings? Here are some additional resources related to the nature of science and fields of science: Science Sampler: Jumping to the Right Conclusions, Inferences, and Predictions; Presenting a Logical and Reasonable Case Using Logical and Reasonable Arguments; Frequently Asked Questions: Questions about Paleontology. This post was originally written by Mary LeFever and published April 11, 2008 in the Connecting News to the National Science Education Standards blog. The post was updated 4/23/12 by Jessica Fries-Gaither. This entry was posted in Earth Sciences, Environmental Issues, Quick Takes, Science, Scientific Method and tagged Anasazi, archaeology, Arizona, Colorado, drought, kiva, pollen, pueblo, science fields, science methods, social studies, village ecodynamic project by jfries-gaither. Bookmark the permalink. The white shows once the son eye pupil turn and think of an idea, a smile”then walk toward the halfway up a hill hole hole. Yes. I have and I will. Thank you.